You can click twice on an image to see it. Then use arrows to move between images. 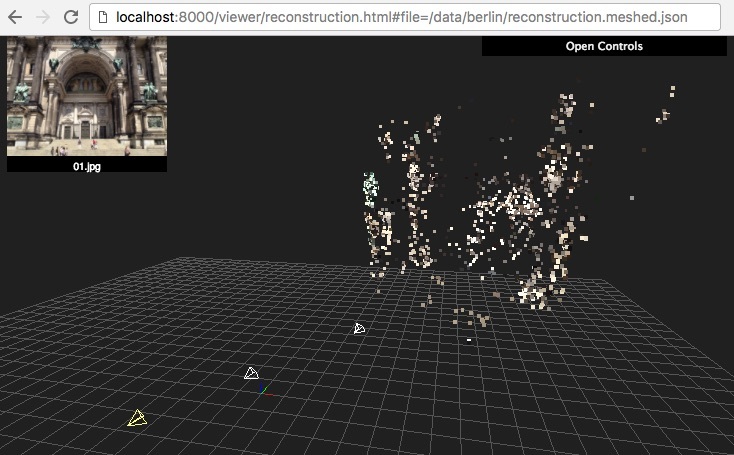 This will run dense multiview stereo matching and produce a denser point cloud stored in data/berlin/depthmaps/merged.ply. 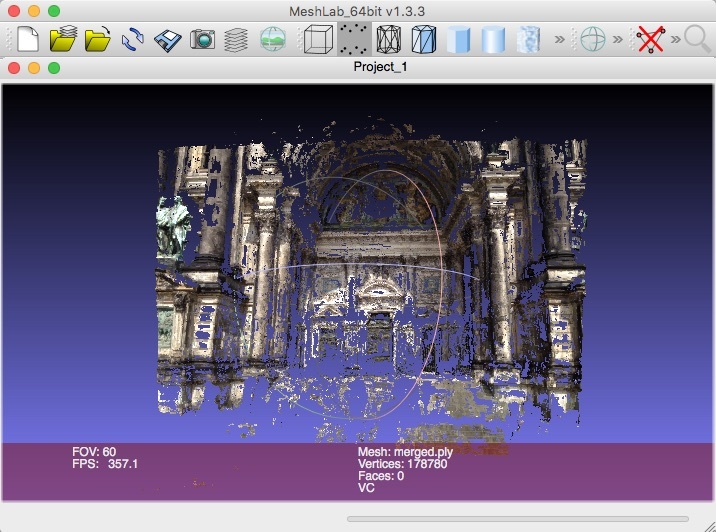 You can visualize that point cloud using MeshLab or any other viewer that supports PLY files. There are several steps required to do a 3D reconstruction including feature detection, matching, SfM reconstruction and dense matching. OpenSfM performs these steps using different commands that store the results into files for other commands to use. The single application bin/opensfm is used to run those commands. The first argument of the application is the command to run and the second one is the dataset to run the commands on. This commands extracts EXIF metadata from the images an stores them in the exif folder and the camera_models.json file. gps latitude, longitude, altitude and dop: The GPS coordinates of the camera at capture time and the corresponding Dilution Of Precision). This is used to geolocate the reconstruction. capture_time: The capture time. Used to choose candidate matching images when the option matching_time_neighbors is set. camera orientation: The EXIF orientation tag (see this exif orientation documentation). Used to orient the reconstruction straight up. projection_type: The camera projection type. It is extracted from the GPano metadata and used to determine which projection to use for each camera. Supported types are perspective , equirectangular and fisheye . focal_ratio: The focal length provided by the EXIF metadata divided by the sensor width. This is used as initialization and prior for the camera focal length parameter. make and model: The camera make and model. Used to build the camera ID. camera: The camera ID string. Used to identify a camera. When multiple images have the same camera ID string, they will be assumed to be taken with the same camera and will share its parameters. Once the metadata for all images has been extracted, a list of camera models is created and stored in camera_models.json. A camera is created for each diferent camera ID string found on the images. focal: The initial estimation of the focal length (as a multiple of the sensor width). k1 and k2: The initial estimation of the radial distortion parameters. Only used for perspective and fisheye projection models. focal_prior: The focal length prior. The final estimated focal length will be forced to be similar to it. k1_prior and k2_prior: The radial distortion parameters prior. By default, the camera parameters are taken from the EXIF metadata but it is also possible to override the default parameters. To do so, place a file named camera_models_overrides.json in the project folder. This file should have the same structure as camera_models.json. When running the extract_metadata command, the parameters of any camera present in the camera_models_overrides.json file will be copied to camera_models.json overriding the default ones. Simplest way to create the camera_models_overrides.json file is to rename camera_models.json and modify the parameters. You will need to rerun the extract_metadata command after that. Here is a spherical 360 images dataset example using camera_models_overrides.json to specify that the camera is taking 360 equirectangular images. This command detects feature points in the images and stores them in the feature folder. This command matches feature points between images and stores them in the matches folder. It first determines the list of image pairs to run, and then run the matching process for each pair to find corresponding feature points. Since there are a lot of possible image pairs, the process can be very slow. It can be speeded up by restricting the list of pairs to match. The pairs can be restricted by GPS distance, capture time or file name order. This command links the matches between pairs of images to build feature point tracks. The tracks are stored in the tracks.csv file. A track is a set of feature points from different images that have been recognized to correspond to the same pysical point. This command runs the incremental reconstruction process. The goal of the reconstruction process is to find the 3D position of tracks (the structure ) together with the position of the cameras (the motion ). The computed reconstruction is stored in the reconstruction.json file. This process computes a rough triangular mesh of the scene seen by each images. Such mesh is used for simulating smooth motions between images in the web viewer. The reconstruction with the mesh added is stored in reconstruction.meshed.json file. Note that the only difference between reconstruction.json and reconstruction.meshed.json is that the later contains the triangular meshes. If you don’t need that, you only need the former file and there’s no need to run this command. This command creates undistorted version of the reconstruction, tracks and images. The undistorted version can later be used for computing depth maps. SfM algorithms have options and depend on various parameters. OpenSfM comes setup with default values for each option but you might want to tune some options for a particular dataset. Options used to reconstruct a dataset can be set by editing the file DATASET_PATH/config.yaml. Any option present in this file will override the default. Checkout the default configuration to see the list of options. When EXIF data contains GPS location, it is used by OpenSfM to georeference the reconstruction. Additionally, it is possible to use ground control points. Ground control points (GCP) are landmarks visible on the images for which the geospatial position (latitude, longitude and altitude) is known. A single GCP can be observed in one or more images. OpenSfM uses GCP in two steps of the reconstruction process: alignment and bundle adjustment. In the alignment step, points are used to globaly move the reconstruction so that the observed GCP align with their GPS position. Two or more observations for each GCP are required for it to be used during the aligment step. In the bundle adjustment step, GCP observations are used as a constraint to refine the reconstruction. In this step, all ground control points are used. No minimum number of observation is required. GCPs can be specified by adding a text file named gcp_list.txt at the root folder of the dataset. The format of the file should be as follows. The first line should contain the name of the projection used for the geo coordinates. Where <geo_x> <geo_y> <geo_z> are the geospatial coordinates of the GCP and <im_x> <im_y> are the pixel coordinates where the GCP is observed. The geospatial coordinates can be specified in one the following formats.